The Nobel prize of economics has just been awarded to Richard Thaler : co-author of Best seller “Nudge” and pioneer of behavioral economics principles applied to real world problems: from public policies to business issues. One field will soon be revolutionized by its findings : the #CX “customer experience industry” industry. 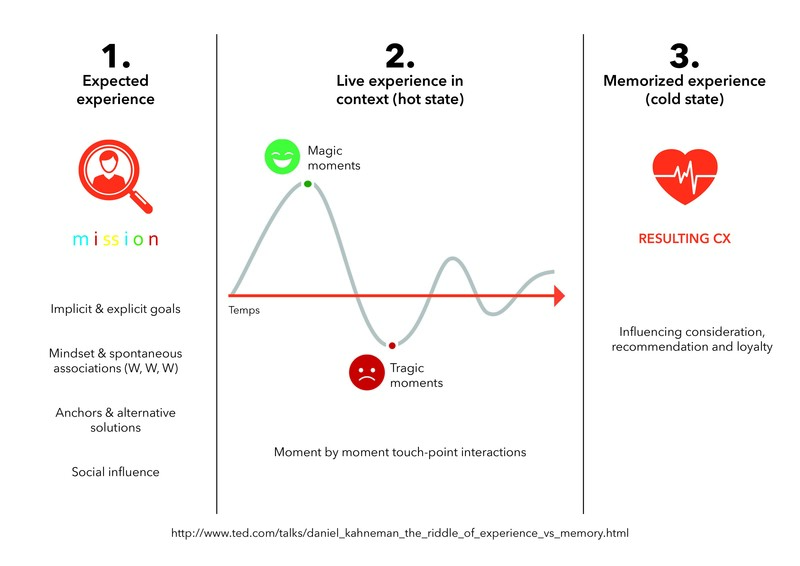 In the 1990s, Pine & Gilmore’s, authors of book The Experience Economy proposed that to create value beyond product and services, companies should strive to create experiences that are memorable and persona redefining the experience from the “user” point of view, Pine & Gilmore who first popularized Customer Experience concept have helped marketers rediscover the power of emotions and context beyond marketing promises. Reframing the theory from “sensorial or experiential marketing” (the company perspective) to “customer experience” (the consumer perspective) was a brilliant move to help brands redefine their proposition through the eyes of the customer, not the advertiser. But today, behavioral economics (BE) provides a new understanding of how real people make real decisions in real life: we are not rational “econs” making optimal decisions, but “humans” prone to external influences and making errors (most of them being systematic). At BVA, BE insights have inspired many of our methods, including levers to promote behavior change: ‘nudges’ which prove extremely useful to optimize customer journeys (see “Nudge me tender”our Esomar Best paper and Excellence award). In addition, because “People can perfectly explain what they couldn’t predict the day before” (said Amos Tversky, Kahneman Co-author), cognitive biases have also helped us to filter what can be trusted from the “voice of the customer”, and what implicit drivers should be researched instead. But behavioral economics also sheds a new light on the concept of experience. Memorized experience is, in fact, mostly influenced by emotional peaks and final moments (Kahneman), and this has changed our frameworks of how to articulate “hot” and “cold” measurement. But it also also inspired many new approaches to create “value” and optimize pricing. In a real-life context, people assess value through relative comparison with alternatives or by time and effort to gratification, not by giving a mark between one and ten: this offers a great number of marketing levers to influence their perception beyond a customer satisfaction score, starting with expectations. “Customer experience is a trace left in the memory of a human (a customer or a prospect), associated with a branded product or service and one that will influence – consciously or not – his or her future behavior when engaging with the brand. Experience results from association with emotional imprint of past interactions with organization-branded touch points, but also from implicit comparison with alternative reference points, activated in any given situation”. This definition emphasizes a perceptual and behavioral result within the mind and body of the subject (a sensori-motor result and not a description of the interaction from an outsider perspective). It also highlights the importance of situational factors framing the choice: this is to avoid mistaking the experience that brands want to deliver and what consumers truly “live” when confronted with alternatives. We have also expanded the concept of customer to one of prospects: to also ensure measurement of the experience of those who can rapidly become a missed opportunity when metrics are focused on existing clients. Of course like any definition, it can certainly be debated ! That’s why I would like to hear your thoughts and comments to push the thinking further ! And I hope you share the joy we all have @bva-group to see Richard Thaler awarded Nobel prize.